This pretty card was produced by Suchard Chocolates, in 1905. 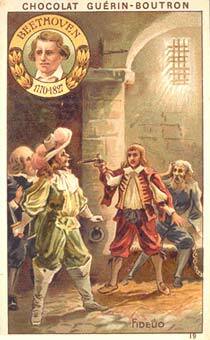 It is part of the "Famous Men", collection of 12 cards. This is number 3. The reverse doesn't carry any information on Chopin or Beethoven, but an illustration of the Suchard symbol. 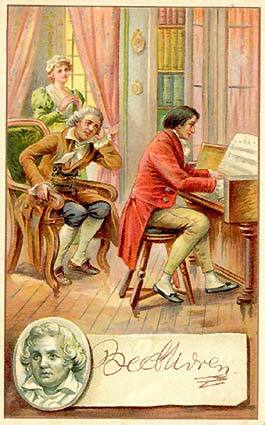 This French card shows Beethoven listening to someone playing the piano (Liszt?). The reverse presents Beethoven's life (pass the mouse over the card to reveal the reverse). Actual size of card : 9 cm x 14 cm. This card was produced in 1899 by the Stollwerck brothers, and was offered with their chocolates (sold under the same name). They were sold in vending machines in public places, stations etc. Actual size of card: 4.8 cm x 9.4 cm. This second card dates from 1908. It's numbered 442-6. It's one of 6 from a series of composers. The reverse is in German and gives a brief overview of Beethoven's life and works. Actual size of card: 9.4 cm x 4.8 cm. This card was produced by 'Chocolat Guérin-Boutron'. The front is a drawing of Fidelio with the portrait of Beethoven on the upper left corner. The card is numbered 19. Actual size of card: 6.5 cm x 10.5 cm. This card was produced for the lovers of chocolate Jacques. Il is the number 59. The front side shows a portrait of Beethoven and part of a musical score. 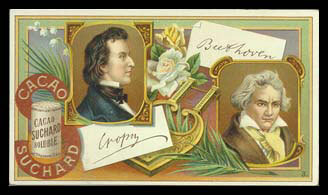 The reverse side is both in French and in German and presents Beethoven as the greatest composer. Actual size of card: 5 cm x 7 cm. This card was produced for the lovers of chocolate Jacques. Il is the number 208. The front side shows a portrait of Beethoven made from his life mask. The reverse side is both in French and in German and presents Beethoven as the greatest composer (it is not the same text as the previous card). Big card by "Chocolat Martougin - Anders". 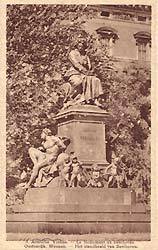 The front side is a picture of the monument of Beethoven in Vienna. This card could be sent by mail. The card is numbered 9. Actual size of card: 8,5 cm x 14 cm. This card was issued in Uruguay by Jacob Sisler, circa 1930. It is card number 227 from a set of 278 cards entitled "Cosmos el hombre y el mundo en que vive" (Man and the World in which He Lives). The card was given as a free premium and was inserted into various packages of Chocolates. 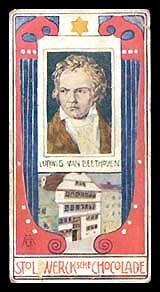 The front of the card shows the name, card number and an illustrated colour picture of Beethoven playing the piano for his friends. Actual size of card: 4.2 cm x 3 cm. 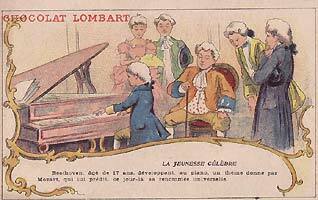 This French card was produced by the 'Chocolat Lombart'. It shows Beethoven playing the piano in front of Mozart. Actual size of card: 10,2 cm x 6,5 cm. It does not look like Beethoven, singing near the organ, but his name is written on the card!